1. There is nothing worse than a “show” fan. I went to a Portland Trail Blazers game this past weekend and we (I say “we” because I’m an Oregonian until I graduate from college) were playing the Miami Heat. Fun fact: The Heat have the most bandwagon fans on the face of this planet. And perhaps Mars too. Don’t get me wrong, I think Dwayne Wade and Lebron James are amazingly attractive. I mean talented. But just because you love a player doesn’t mean you just hop from team to team to team like a basketball hussy. I’d marry Lebron in a nanosecond but I still rooted for the Blazers like a tolerable human being. Anyone who started liking the Heat in the past two years should have a soda poured on their head. 2. Objectivity is impossible. Irrationality is possible. Disliking players and teams for no reason at all is very enjoyable for me. But what’s even more enjoyable is latching on to something totally unrelated and using that to hate on them. Example: Tony Parker cheated on his beautiful wife, Eva Longoria, with his teammate’s wife. So in my mind he went from a talented point guard to a sleazy Frenchman. He’s having the best year of his career, go figure. Damn him. P.S. I could spend a whole post dissing on the Lakers in this fashion but perhaps that will come later. 3. Basketball is more than a job. Or it’s just a job. How many times has someone said “It’s not personal, it’s business”? Countless. Dwight Howard basically said it when he demanded to be traded a while ago. Players do that from time to time and usually they get traded immediately. The Magic, however, kept him and could keep him the whole season before his contract runs out. What if marriages or divorces worked like that? “Oh hey honey, I want to leave you right now. I want to be with someone who will give me more money. You don’t do enough for me and I’ve stuck around for years and years and I’m not happy so I’m done.” And the spouse replies, “No, sorry, you’re stuck with me for the year. ” Talk about awkward. All of his teammates know he wants out. All of the fans know. How do you still want to be around the guy? If it’s just a job, then why can’t he pack a box of sleeves and Under Armour shirts and just leave? 4. 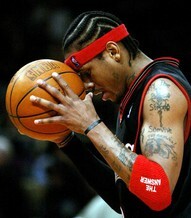 I love Allen Iverson. Yeah, I really do. He deserves a ring. Luke Walton should hand over his ring, that’s the truth.